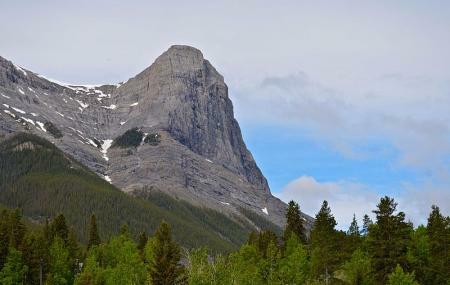 Just 8 miles south of Canmore, Ha Ling Peak is a mountain located in Alberta's Canadian Rockies. A popular trekking destination, this mountain was previously known as Chinaman's Peak. This 3.5-mile heavily trafficked trail takes you through lovey and icy forest settings. The trail heads up steeply and is rated one of the most difficult trails in the area. Great hike! We didn't make it to the very top because of wind but made it high enough to get a great view of Canmore. It is difficult all the way up and it requires some level of physical fitness. The view is totally worth it! This trail is very easy to access. The switchbacks provide constant elevation gain without any loss along the way. Views of the surrounding valleys quickly open up. Despite the crowds of people bears are sometimes seen in this area, so don't be overconfident - bringing bear spray is still a good idea. This iconic peak provides excellent views of the bow valley. A fantastic hike. It's close, and can be accomplished in a few hours, so it makes a nice quick evening hike. Not to mention the rewarding views. Fantastic Hike super great for beginners. If you aren't hiked up any mountains before, this is honestly a great place to start - and it's free - you don't need to pay for the entrance fee to the park since this isn't in banff. You get a wonderful view of canmore at the top and a great sense of accomplishment for (relatively) little work. Highly, highly recommended.